It's not often we get snow in the South. So when we do, we like to take advantage of it. This morning I woke up to the soft crunch of footsteps walking in the snow. I'd fallen asleep on the couch anxiously awaiting the first snowfall of the season, but by 11 PM, a thick sheen of ice covered the grown with no snow in sight. I fell asleep feverishly praying for snow. It's hard enough being trapped inside all weekend, but toss in a 5 year old who's upset because there's no snow, and it's pretty much unbearable. So you can imagine my excitement when I woke up to snow. Not much. But certainly enough to keep a 5 year old happy, and a mom sane. Luckily, I had hit up the store in anticipation of our snow day. 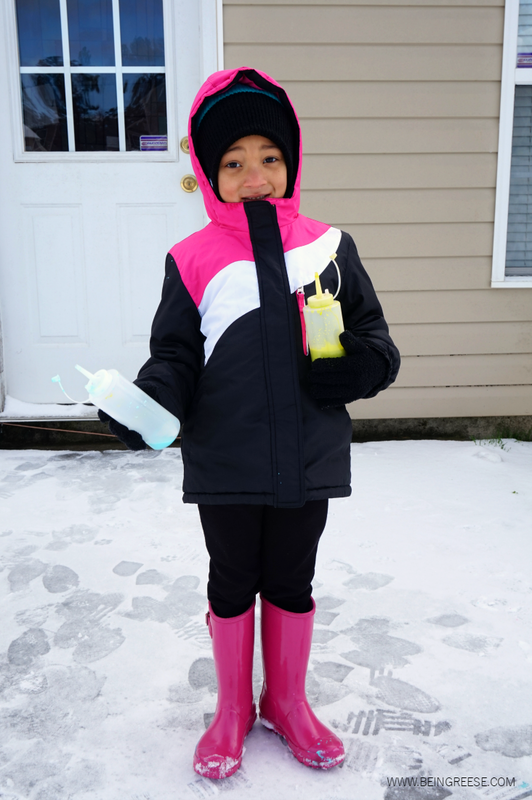 After grabbing the typical snow day essentials: soup, hot cocoa, and wine (hey, priorities), I headed to Michael's to come up with some fun snow day activities. Unfortunately every store in within a 100 mile radius had already sold out of sleds, so I figured I'd better come up with something to keep Little J distracted. Over the summer, Little J and I had a ball painting rocks with colorful spray bottles. So I added a slight twist to that activity. Instead of spray bottles, I snagged a few clear condiment bottles and filled then with paint and water. Because I spend so much time crafting, I have tons of paint lying around, so this fun snowy day activity literally cost me $2. 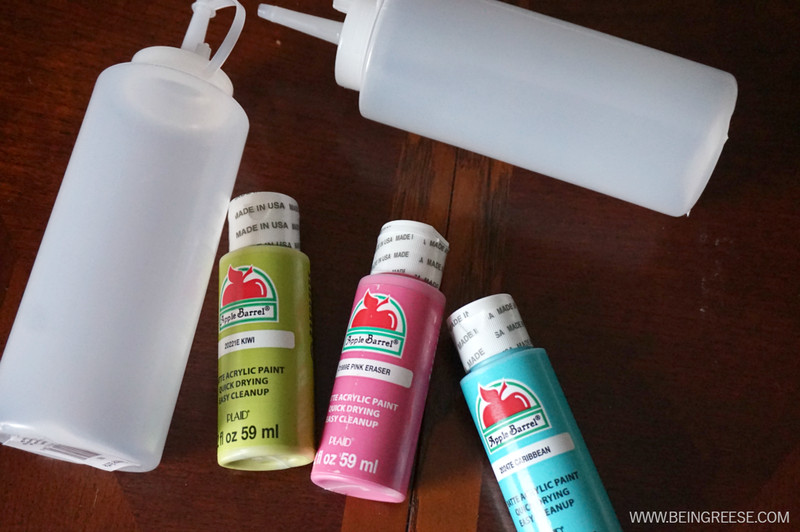 If you don't have paint already, no worries, you can snag small bottles of paint for as little as .50 cents from Wal-Mart, Michael's, Hobby Lobby or any other arts and craft store. So basically for less than $10, you can keep the kiddos entertained, and even have some fun yourself. That's what I like to call a win-win. 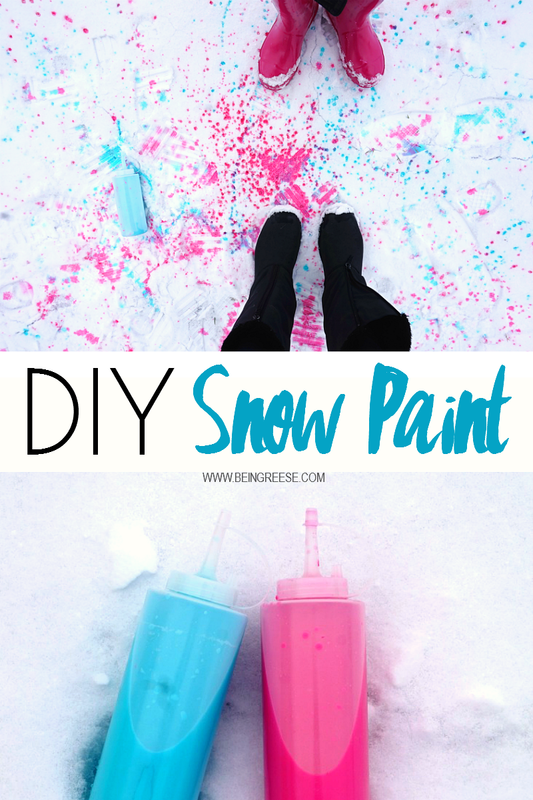 For this activity, I used 3-4 squeezes of paint and filled the bottle to the top. Once it was filled, I secured the lid (make sure it's tight guys, as I unfortunately failed to check before shaking) then gently shake the bottle to ensure the paint is evenly mixed with the water. 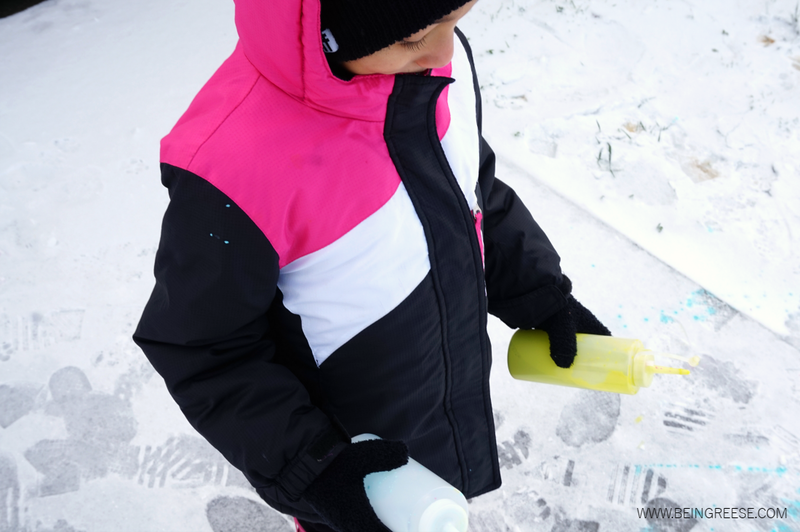 Once the paint bottle are ready, get the kiddos all snuggled up, and head out to have some painting fun. 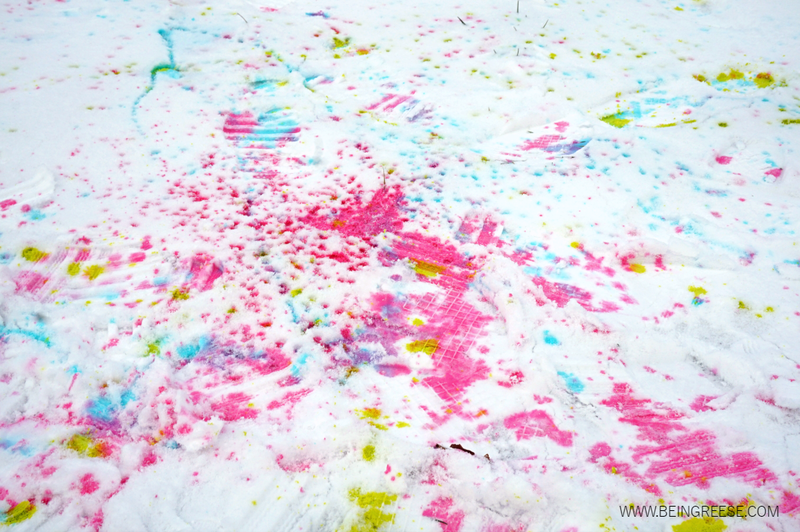 What are some fun snow day activities or traditions does your family have? Feel free to comment below in the comment section. As always, if you found this tutorial helpful, feel free to PIN to Pinterest for later, or TWEET on Twitter to share with friends and family. This looks such fun! Thanks for sharing.